"Sampath Speaking" - the thoughts of an Insurer from Thiruvallikkeni: Coimbatore tusker - Madukkarai Maharaja is no more !! Coimbatore tusker - Madukkarai Maharaja is no more !! Elephants attract me ~ sadly, not all news on elephants is good ! I have posted many a times on my love for that majestic beautiful tusker named “Azhwar” and how the locals cried when it passed away. Do not remember or know its age when it died peacefully. Nat Geo reports that for African elephants, the median life span is 17 years for zoo-born females, compared to 56 years in the Amboseli National Park population. For Asian elephants, the results are "much more worrying because they are the rarer of the two species." Zoo females only live 19 years—about half the life span of the Myanmar timber elephants, which, on average, survive until 42. It is stated that Asian elephants bred and born in captivity died earlier than those imported into zoos from the wild. 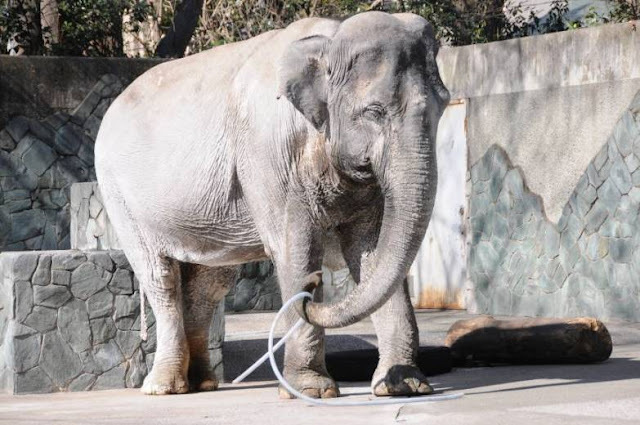 Away a couple of months ago, Hanako, the oldest elephant in Japan, died at Inokashira Park Zoo in Tokyo. The female elephant was 69 years old. Hanako arrived in Japan shortly after World war and gave dreams and hopes to children,” Tokyo Gov. Yoichi Masuzoe said in a statement. It was a gift from Thailand as a symbol of friendship in 1949. After living in Tokyo’s Ueno Zoo for a few years, she was moved to the Inokashira zoo in 1954. Her 69th birthday party was supposed to be held March 21 but was canceled due to poor health. There was an internet petition sympathizing it to be living a lone life for decades, calling for its movement to Thailand, so that it could live with other elephants, alas, that was not to happen. In wild, the loners are roguish. I have recently posted on the taming of a wild tusker that had been damaging crops, hurting people and terrorizing many humans. It was a big operation, Kumkis - Kaleem, Sujai and Pari were brought to the spot to make the wild tusker board the Forest Department vehicle. With the help of the kumkis, forest staff tied a thick rope across the tusker’s neck and legs. The kumkis struggled hard, goaded the tusker into the vehicle. With a large crowd of locals watching, the animals captured. The forest officials were elated after the safe capture. The elephant named as Madhukkarai Maharaj, was intended to be trained to become another ‘kumki’. This Deccan Chronicle photo shows the ‘rogue elephant’ on a truck and am surprised with the people standing so close to it ! That was not to be ~ the wild tusker nicknamed Madukkarai Maharaj trapped by the Forest Department in Coimbatore in the small hours of Sunday breathed its last on Tuesday evening at the Varagliar elephant camp. Officials said that the cause of death could be ascertained only after conducting a post-mortem. 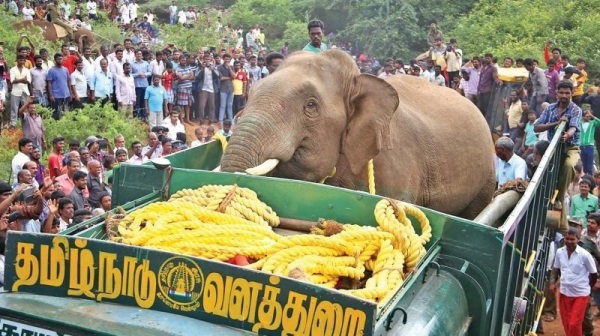 After it was ‘trapped’, the tusker was lodged inside a ‘kraal’, a cage made of iron beams and wooden logs at the camp in Anamalai Tiger Reserve. Till Monday night, despite having been administered an antidote against the tranquilliser, the tusker was said to be in a slightly sedated condition. On Tuesday, the tusker is said to have made efforts to break out of the kraal. In the process, it is suspected to have sustained head injuries and died. ‘Maharaj’ is the second elephant to die in Coimbatore district in as many days. On Monday, a lactating female elephant was fatally knocked down by a train near Madukkarai. The death prompted wildlife enthusiasts to question some aspects of the capture and the operation, calling it a great setback to conservation efforts given the unfavourable male-female elephant population ratio of 1:25. However, the coordinator of WWF is quoted as saying that tranquilising method should not be blamed as there are no other alternative methods for capturing the wild animal.